Home / GST-Tally / TallyERP.9 Lessons / How to Create Goods/ Services in Tally for implement GST in Invoice? 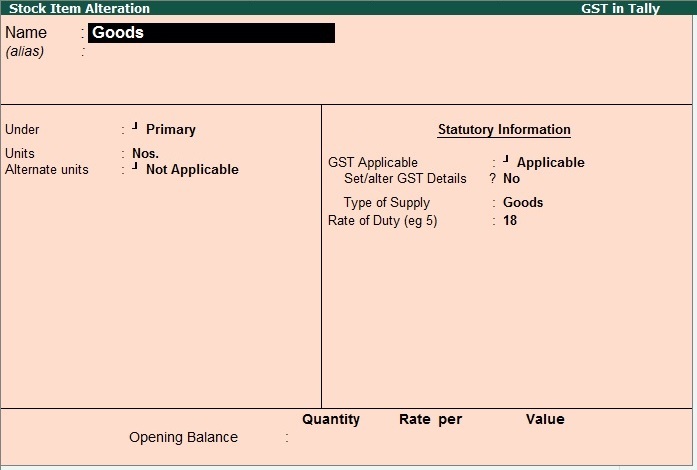 How to Create Goods/ Services in Tally for implement GST in Invoice? GST is purely based on supply of Goods or Services. But if you want to Create a GST Tax / Services Invoice in Tally then you must setup your Goods or Services in Inventory. Tally calculate tax or manage a invoice on based of inventory, without inventory you can't be make a taxable invoice. 6. Set GST Applicable is to yes. 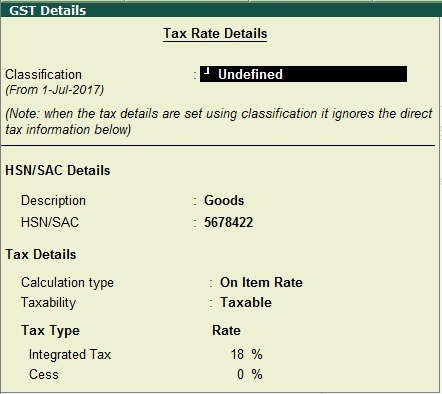 Classification remains undefined, Description of your inventory with HSN Code, Calculation type, Taxabilility whether taxable or not, Tax rate as prescribed in GST. 8. When you select Taxable a new window will appear on your screen to Setup the tax amount on which tax is applicable. Select type of Inventory (Goods or Services), Rate of duty (Tax rate as mentioned in GST Act.). Press Enter to Save.